Anglesey is a geologist\'s paradise. This book takes you on a journey round the coast of Anglesey by way of 25 excursions of different complexity and easy access. For each, the colourful rocks and their features are clearly explained and illustrated. Anglesey is a geologist’s paradise. Its spectacular rocky coastline loved by walkers and naturalists, and its beautiful beaches popular for family holidays, together reveal the best variety of rocks in the whole of Britain, with ages ranging from nearly 700 million years old, to deposits from the last Ice Age. This book takes you on a journey round the coast of Anglesey by way of 25 excursions of different complexity and easy access. For each, the colourful rocks and their features are clearly explained and illustrated. Excursions include ancient volcanoes at Llanddwyn Island, dramatic folds at Rhosneigr, Rhoscolyn and Trearddur Bay, spectacular coastal scenery near Cemaes Bay, Parys Mountain, limestone and fossils on the east coast around Benllech Bay, and remarkable glacial deposits and igneous intrusions on the Menai Strait. 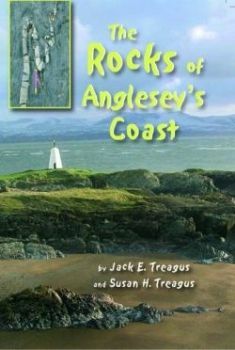 Written in a way to appeal both to amateur geologists and families on holiday, the book begins with general information about Anglesey’s rocks and geological events, ends with a glossary of geological terms to aid the beginner, and contains a geological map with excursion locations within the back cover. The Rocks of Anglesey’s Coast will excite and educate all who enjoy the landscape of this beautiful island.